First off, congrats on attaining financial independence at a young age. Quite the accomplishment! Why and when did you decide you wanted to pursue early retirement, and what does FIRE mean to you in your day-to-day life at this point? Thank you, Soren. Interestingly, financial independence wasn’t a concept I was familiar with until I was age 39. I suppose I thought I was financially independent when I started buying my own groceries as a freshman in college, but that’s not the financial independence we’re talking about today. The financial independence we’re discussing is the freedom from relying on earned income to maintain our desired lifestyle. You can get there with stocks and bonds totaling at least 25 years of anticipated spending, or you can do it with passive income that exceeds your spending needs. A combination of the two can also qualify you, but the bottom line in any scenario is that you’re in a position in which paid work is 100% optional. From the day I finished my anesthesia residency, I started earning and saving. In a graduating class of about 22 residents who finished training on Friday, June 30th, I was the only one working Monday, July 3rd. Over the next decade, I got married, we built a large home and started a family, but I always prioritized saving and investing. I didn’t know what I was saving for exactly, but when I read about this amazing concept called financial independence, I realized we basically had it. It wasn’t until then that a particularly early retirement appealed to me. I’ve since cut back to a part-time schedule that gives me weeks off at a time. In the past four months, we’ve spent a few weeks each on family getaways to Mexico and Hawaii. I may wrap up my clinical career as early as next year. Doctors are compensated well, but certainly face challenges navigating their financial lives, with student loan debt and plenty of noise: securities and financial advice are often aggressively marketed to doctors (and not all of it good). How did get your head above water, financially speaking, early in your career? What advice do you have for doctors who are just out of school, perhaps with sizable student loan debt? People hear our salaries and assume we have it made, but we tend to have fairly large holes to dig ourselves out of first. I finished medical school 16 years ago when tuition was much lower. Both my undergraduate education and medical schooling was at my home state’s flagship public university, and I had a full-tuition scholarship for undergrad. I lived with roommates in cheap apartments near campus throughout, only taking out subsidized loans back when that was an option. I read Andrew Tobias’ The Only Investment Guide You’ll Ever Need at my father’s urging before I finished medical school. That kept me from making big mistakes. I’ve since read a number of other personal finance and investing books, but that first one was the key to giving me a bit of basic knowledge; I certainly didn’t get it from school. My recommendation for young docs is to live well below their means, avoid taking on debt for anything but school and eventually a home, and not to follow the lead of classmates and colleagues who may appear to be doing very well, but may simply be very good at spending most of their income. What sort of asset allocation and portfolio strategy have you pursued as you’ve made the journey to financial independence? Any big lessons along the way? I’m mainly invested in low-cost passive index funds. For those, I have a roughly 90% stock allocation (includes ~ 10% REIT) with about 10% in bonds. I have also invested in a couple small breweries with “play money.” The details of my current portfolio can be found here. Now that you’ve reached FIRE (Financial Independence Retire Early) status, how has your investing strategy shifted? As I contemplate having no active income, I plan to shift to keeping a certain number of years’ worth of spending in bonds. The average bear market lasts fewer than two years, and five years in bonds should be enough to spend down in the case of a prolonged bear. With an anticipated withdrawal rate of 3% or less, I expect my portfolio will grow most years, so my glidepath will presumably have me holding a smaller percentage in bonds as time goes on. I could easily live 50 years or more after I retire from medicine, and I’m comfortable remaining invested aggressively. That may sound foolish to some, but it’s actually a safer plan than cutting back to a more conservative 50 / 50 portfolio with the time horizon I’m looking at. On the Physician on Fire blog, you’ve done some writing on real estate investing, and investing through EquityMultiple and some other platforms. How do you think about real estate, and online passive real estate investing (i.e. ‘real estate crowdfunding’) in the context of your investing goals? I’ve been underwhelmed by the performance and volatility of REITs, which has been the main way I’ve invested in real estate outside of our actual home(s). I believe the fund I’m in, a popular index fund, lost 78% in the last recession. I’ve started to shift some of the money I’ve had in REITs to debt and equity deals in the crowdfunded real estate space. That includes an investment in a large residential apartment complex in Connecticut via EquityMultiple. I like seeing the actual properties I’m investing in and having the ability to look over the projections and anticipated returns. I recognize there is more risk in these investments than a savings account returning 1.5%, but I can’t imagine being diversified across multiple crowdfunded deals is riskier than having nearly 10% of my portfolio in an index fund that lost 3/4 of its value in a nasty bear market! I know that you’ve pledged to donate half of your site’s profits to charity, which is fantastic! Any particular charities or organizations you are excited about these days? Thank you for recognizing that. I had a hard time reconciling the fact that I was telling the world I no longer needed to work for money via a website that had the potential to earn me more money. Early on, I made a pledge to donate half of my website profits, which I do largely via a donor advised fund. One of our most recent donations was to One World Surgery. My family and I will be participating in a medical mission with them in Honduras this May. Most of our dollars go to local charities helping the underserved, but I’m also interested in the concept of effective altruism — doing the most good per dollar in parts of the world that have the greatest need. Thank you for the invitation to share a part of my story. 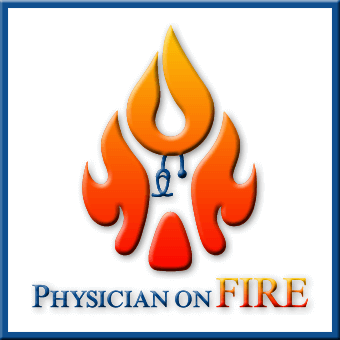 You can find me on Twitter @physicianonfire and learn more about me at physicianonfire.com. Thanks for your time and insight, PoF. Again, congrats and keep up the great work! Soren heads up all EquityMultiple communication efforts, including educational materials and research.